Panther Kitchen- Turkey Taco Burrito Bowls - NCHS Live! Do you want a fun and easy way to make a healthier Chipotle-styled meal without spending the money? 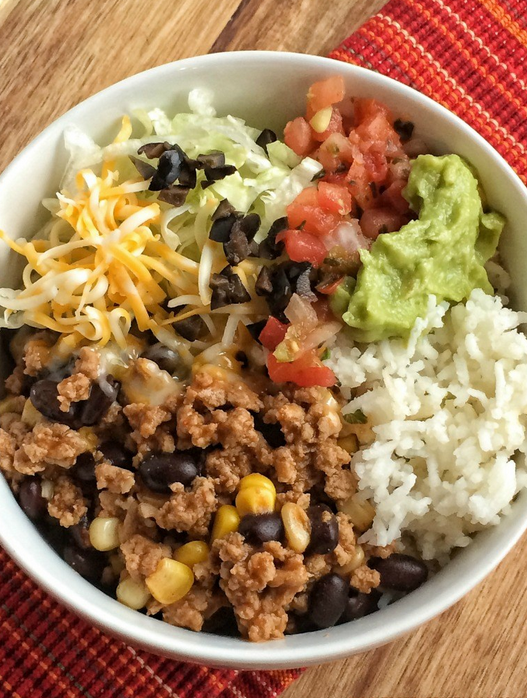 These turkey taco burrito bowls are flavorful and a quick 30 minute dinner that the whole family will love. Taco toppings: shredded lettuce, pico de gallo, salsa, avocado, olives, lime, shredded cheese, etc. In a large nonstick skillet, over medium high heat, cook the ground turkey with the salt and pepper until cooked through and no longer pink, breaking the meat into small pieces as it cooks. Drain. Add the cumin, garlic powder, chili powder, onion powder, oregano, paprika, and flour. Stir the mixture constantly for 1 minute while it cooks. It will be crumbly. Slowly add the beef broth, a little bit at a time, while whisking to let it thicken up. Add in tomato sauce and stir to combine. Bring to a boil. Once boiling add the black beans and corn. Turn heat to medium and let simmer for 15-20 minutes or until thickened.